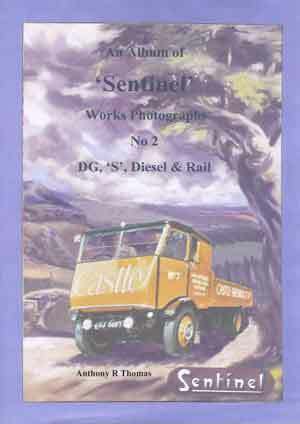 This book contains 172 pages with 255 carefully chosen works photographs from the authors collection illustrating all the Sentinel works products not covered in Album No 1. Beginning with the DG waggon introduced in 1927 and the tractor derivatives followed by the lightweight pneumatic tyred version launched in 1931. Many photos of the revolutionary `S' type waggon with its unique four-cylinder single-acting engine, introduced in 1933 is also covered. Brief details of the experimental Doble steam waggons and Doble rail applications are included. The complete story of the Sentinel shunting and main line locos and railcars are illustrated, built from 1923 to 1956. Photos of some wartime products are also shown including the Sentinel-HSG lorries. Finally the post war Diesel Lorries & Busses built from 1948 to 1957 are covered. The main appendix lists all known Sentinel DG & `S' type waggons and tractors built. A further appendix lists all the Sentinel locos and railcars built and finally further appendices listing all known surviving Sentinels of all types and ages around the world are included.